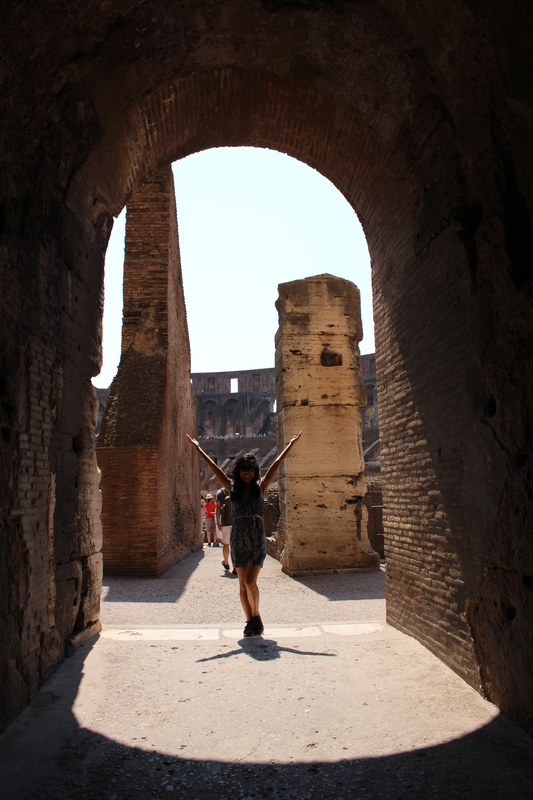 All roads lead to Rome, especially when it’s away we roam. As the capital city of Italy, Rome is the seat of government and the crown jewel of historic sites that attract tourists in droves year after year. From centuries-old colossal monuments to the home of the Roman Catholic church, one cannot overlook Rome’s ancient architecture that harkens to the past, even as the city and people are modernizing around it. In contrast to our leisurely pace in Naples, where Simon and I could purchase last-minute entrance tickets or walk right into a church to enjoy a solitary moment on an empty pew, Rome proved to be quite the opposite. We were prepared for a battle with bumping elbows, selfie stick jousting, and enough photobombs to declare a war. And to commemorate this occasion, we headed to the O.G. 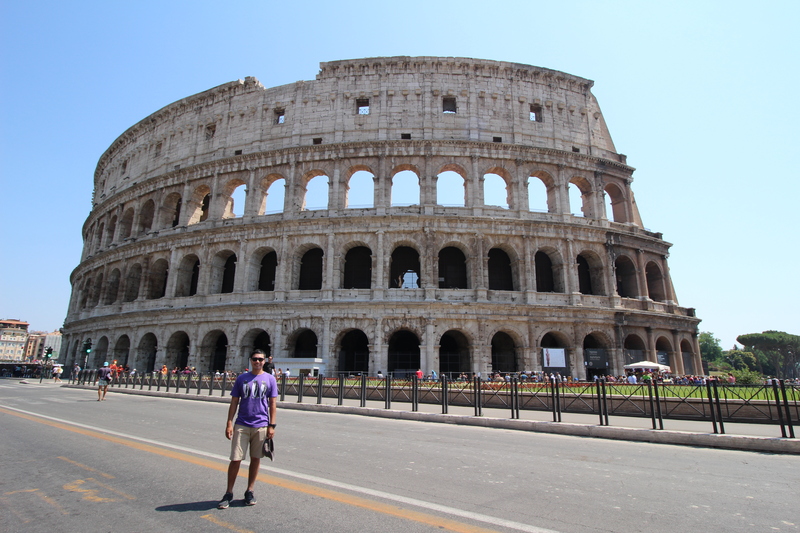 of all sports stadiums: the famed Colosseum. Let the tourist games begin. One could easily book tickets to the Colosseum ahead of time and skip the line – but where’s the fun in that? So early we rose and queued up in a line that snaked around the perimeter as if waiting for the newest pair of Yeezys to drop. From the upper levels of the Colosseum, Simon and I were able to marvel at the panoramic view of the astounding architecture. I ran my fingers along the ancient walls as we wandered about, imagining what it would’ve been like to be a spectator. Inside on the ground level, we wandered through the cool air of the passageways that teemed with tourists as if we were at a sporting event. More than just the largest amphitheater ever built, the Colosseum housed spectacles, albeit in the name of battle, blood, and death. Whether it was gladiatorial games, wild beast fights, or public executions, the Colosseum was once an important place of gathering and the pride of Rome. 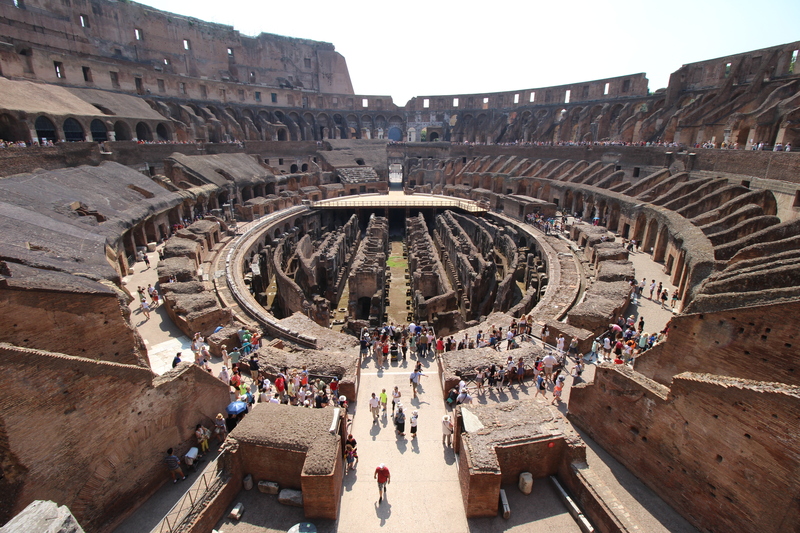 Despite being almost two millennia old, the ruins remain as one of the most iconic symbols of the country, so influential that modern-day sports stadiums are modeled after it. 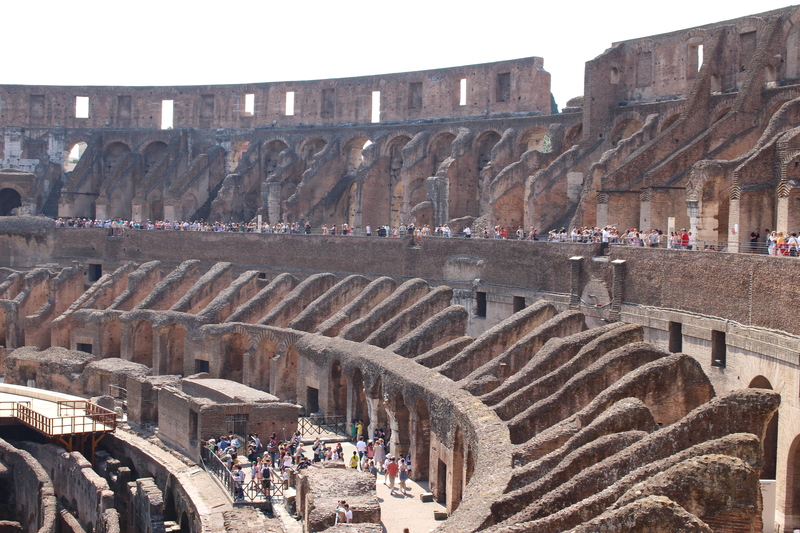 Time has not been kind to the Colosseum, but one could say it’s aging quite gracefully. Even the partial outer shell, damaged as a result of earthquakes, gives it a hauntingly beautiful Phantom of the Opera mask appeal. Archways remain strong yet worn down, and spectator seats are almost non-existent. 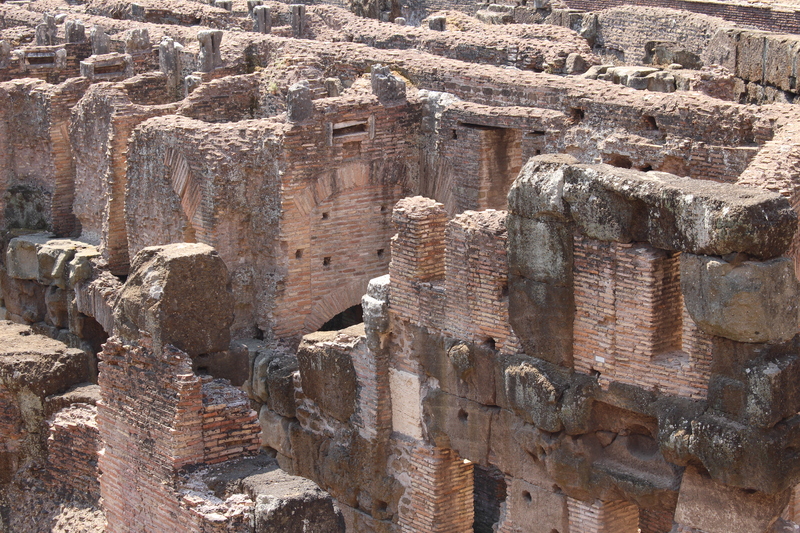 Back in the day, the hypogeum would never see the light of day. 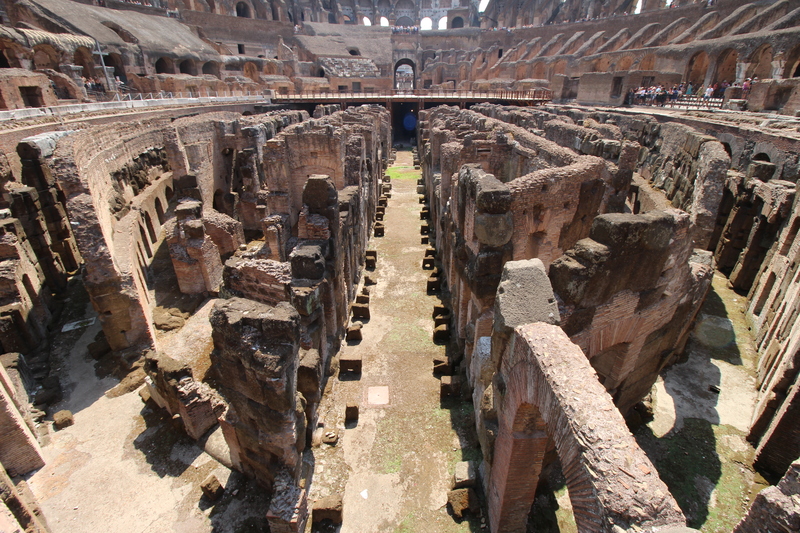 Now exposed for our viewing pleasure, this underground maze of chambers and tunnels that lay below the arena was where prisoners, exotic animals, and gladiators were kept before meeting their untimely death in a battle above ground. While the blood has all but dried and disappeared from the concrete, the stadium that once housed such spectacles has now become a spectacle in its own right. No blood – just sweat and tears were shed during this round of tourist games. The victor? None other than the magnificent Colosseum.